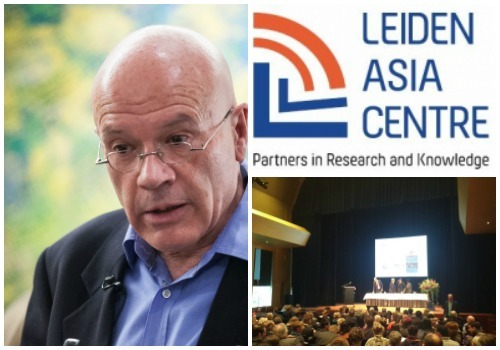 British journalist and scholar Martin Jacques speaks about current Sino-European relations as a keynote speaker at the opening conference of the Leiden Asia Centre. According to Jacques, the way Western media and politics are approaching China is deeply flawed – and it is causing Europe to miss the boat while China is marching forwards. Live blogged. February 9th 2017 marks the much-anticipated opening conference of the Leiden Asia Centre, the expertise centre for socially relevant and applicable knowledge on modern East Asia based in the Netherlands. The conference focuses on Sino-Dutch relations and the relations between Europe and China at large. One of today’s key speakers is British journalist and scholar Martin Jacques (@martjacques), the author of the global best-seller When China Rules the World (2009). One of his key arguments is that China’s impact on the world goes beyond economics, and that it will also have extensive political, cultural and ideological consequences. In introducing Martin Jacques, Professor Frank Pieke, one of the three academic directors of the Leiden Asia Centre, first talks about a separate “global China”, that is different from Western patterns of globalization. China is looking for the “cracks” in the global system; that where it is at its weakest. Its presence is growing in Africa, Latin America, and also in regions like southern Europe. China is not looking for challenges, but it is looking for space, Pieke says. One of the reasons why this is happening, Pieke argues, is that China is hamstrung by the fact that within its own region it is often perceived as a potentially hostile power by, for example, Japan or Korea. It does not have its own sphere of influence from where it can expand into the world. Martin Jacques agrees with Pieke in the sense that “China’s globalization” is different from “globalization” as it is often perceived in the West. Jacques stresses that the concept of ‘modernity’ is plural, and that there is not one modernity because it is not shaped in neo-liberal terms, but it is shaped by history and culture. 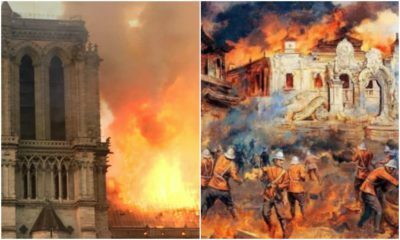 And since China’s history and culture is profoundly different from that of any Western country, we have to understand China in its own terms – not in our terms. The main reason why Western media or politics got China “so wrong” in the last decennia, Jacques argues, is because they failed to do this. The assumptions people have about China are therefore generally flawed, and have failed to predict how China would evolve in the future. China is not a nation state, but a ‘civilization-state’, and is very different from any European nation state. It is a huge united country – and the fact that it is stable and unified is the country’s top priority. The key political values of the Chinese are influenced by this idea, and also fundamentally different from Europe. Why China is politically never going to be the same as Europe is because its key political concepts of unity, stability, and order, based on its long history, are what have shaped and are shaping China. China is historically also very different from Europe in the sense that it has not colonized the way Europe has, and has been less aggressive. Jacques emphasizes that China is in the process of transforming the world. Not only due to its size, but also due to its difference, that is bound to going to project itself and bring its history, values, and traditions to the rest of the world. All discourse about China’s rise has always been economic – discussed within the framework of American hegemony. But Jacques wants to stress that the rise of China goes much further than economics alone: 1.4 billion people are in the process of transformation is all sorts of ways, which is impacting China and the world in numerous ways. Jacques notes that China has sometimes been blamed for being a ‘free rider’ in the international society, or for not ‘contributing’ anything, but this is changing. Since Xi Jinping has risen to power there have been some extraordinary initiatives, such as the Asian Infrastructure Investment Bank. Jacques predicts that also through these kinds of initiatives, its influence is growing, and that those ever said China is not ‘contributing’ will be biting their tongues. Jacques is pessimistic about the prospect of Sino-European relations. China is going ahead, and Europe is basically “stuck”, as it is increasingly turned inwards. Lastly, Jacques addresses the importance of China as a global power and crucial global influencer in various ways. China’s online growth has shown it is the global leader in terms of internet commerce. Tencent, Alibaba, Huawei, Baidu, JD.com, Xiaomi, and other tech companies show that in many ways China is now ahead of Silicon Valley, with China’s online sales being well ahead of those in countries like the USA. Jacques also mentions that the functionality of apps like Weixin/WeChat is more advanced than its western counterpart Whatsapp – meaning that ‘the world’ will also be looking at China when it comes to its digital developments. 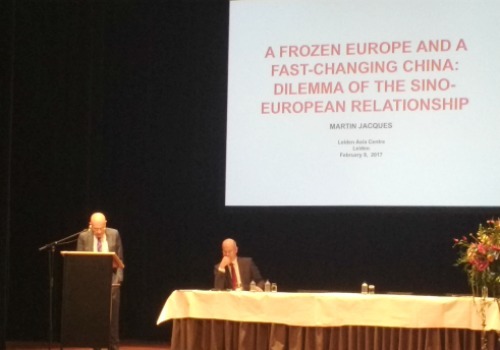 There is one last thing Martin Jacques wants to add to his speech, and it is about Trump, whom he calls “the most frightening president the US has ever had”, and how he will change the EU-USA-China dynamics. Under Trump, he said, America will look after its own interests and will interact with the rest of the world in terms of bilateral relationships rather than from a plural, global position. 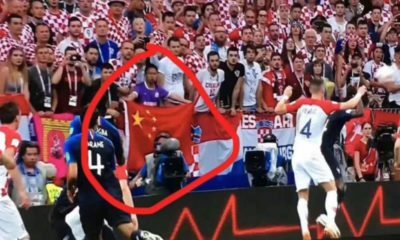 What will the Chinese do? “They will retaliate,” Jacques says. 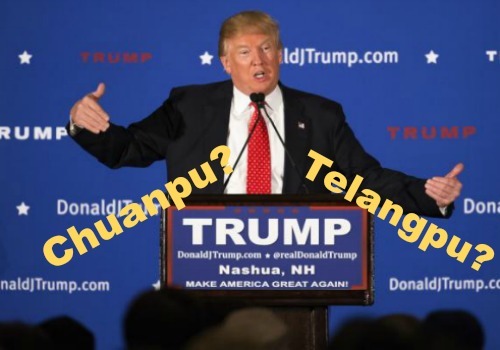 As China-US relations deteriorate, with China pushing America back, they will deepen the agreements with their own neighbors. The One Belt, One Road is an important part of this strategy. Jacques foresees that the rise of Trump will also change Sino-European relations, as Europe -like China- also has little interest in Trump. Jacques stresses the importance for Europe to keep up with China. It is not China that needs to change, he argues – Europe does. 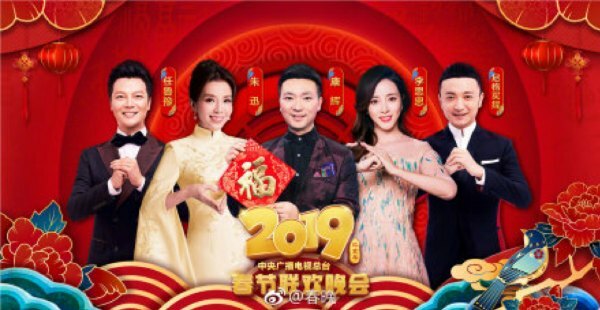 The CCTV New Year Gala is here! We’re live-blogging and keep you updated with the highlights and the low points. It is time for China’s biggest TV event of the year! 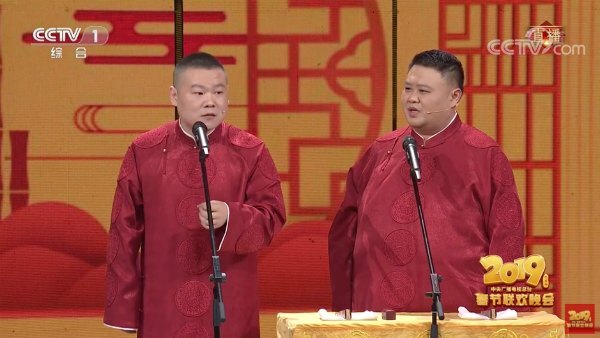 Chunwan (春晚) aka the CCTV Spring Festival Gala is celebrating its 37th edition and kicks off the Year of the Pig. Watch the festival together with What’s on Weibo, as we’ll keep you updated with the ins & outs of the Gala here. It is that time of the year again. The Chinese New Year, better known as Spring Festival, is about to start. 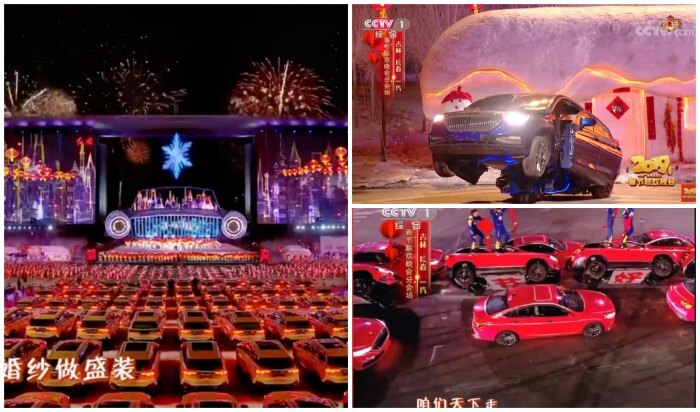 The annual CCTV Gala celebrates the start of the festival with its 4 hours long live televised show. After live-blogging this event in 2016, in 2017, and in 2018, we’re here this year again to keep you updated throughout the show on what’s going on. 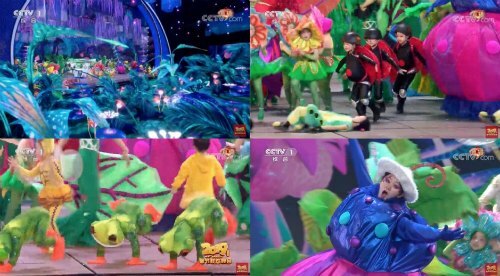 The CCTV New Year’s Gala (中国中央电视台春节联欢晚会 or Chunwan 春晚) is an annual live television event that is broadcasted by the national television station CCTV on New Year’s Eve. It first aired in 1983, and is watched by millions of people. In 2012, it broke the Guinness records for being the “most watched national network broadcast in the world” when it had over 500 million viewers. 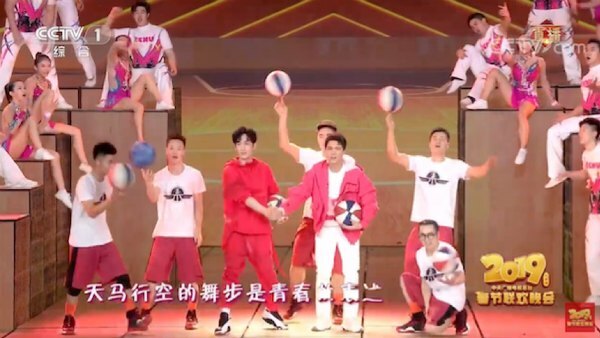 Last year, the show drew more than one billion viewers (Gao 2012; Jing 2019). Despite the common criticism on the show, it is still much anticipated every year. The Gala features different acts, including singing, dancing, and comedy. It is a tradition for families to gather around the TV to watch the Gala before the New Year comes at midnight. 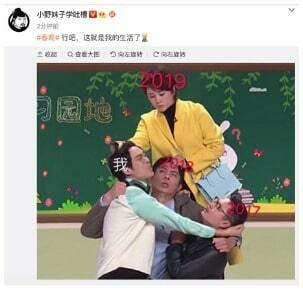 It has also become a tradition to comment on the show and complain about it, something that is especially visible on Chinese social media, where the show inevitably becomes a trending topic every year. 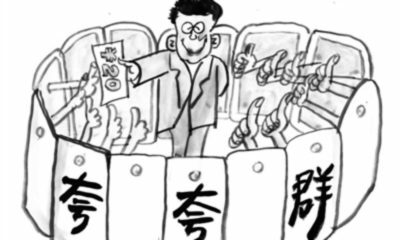 Criticism on the Gala is actually so commonplace that the sentence “there’ll never be a ‘worst’, just ‘worse than last year‘ (央视春晚，没有最烂，只有更烂) has become a popular saying over the years (Wang 2015, 192). 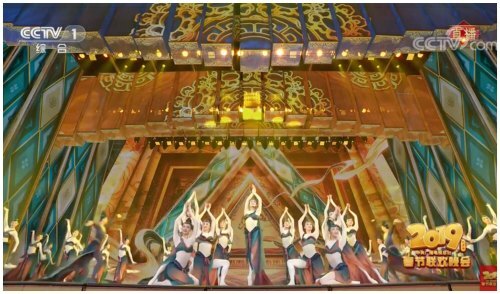 Although the Gala is a live broadcast from CCTV’s No.1 Studio, every year’s show has a taped version of the full dress rehearsal. As described by Scocca (2011), the tape runs together with the live broadcast, so that in the event of a problem or disruption, the producers can seamlessly switch to the taped version without TV audiences noticing anything. It is time for China’s biggest TV event of the year! Chunwan (春晚) aka the CCTV Spring Festival Gala is celebrating its 37th edition and kicks off the Year of the Pig. Watch the festival together with What’s on Weibo, as we’ll keep you updated with the ins & outs of the Gala. 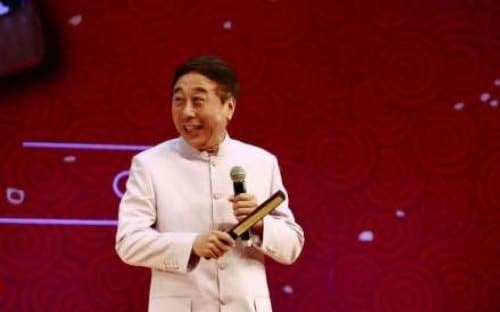 Just some six hours to go before the annual biggest live televised event in the world, the Chunwan, kicks off, and already the program’s timetable is sparking controversy: one of China’s biggest comical actors, Feng Gong (1957), will not participate in tonight’s event after performing there for 32 years. 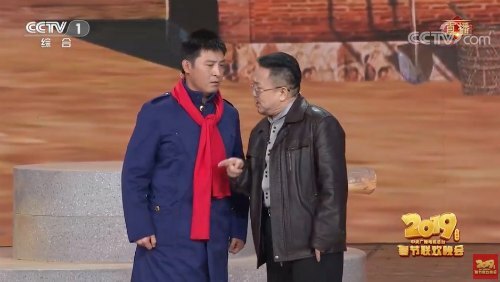 Feng Gong’s ‘xiangsheng’ crosstalk sketch apparently did not meet the requirements of the show’s strict screening, meaning his act will not come up tonight. 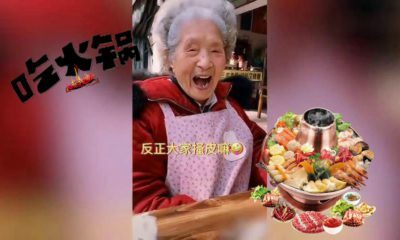 Thousands of Chinese netizens are disgruntled, saying that Feng Gong’s appearance during the show has a certain nostalgic meaning to them. 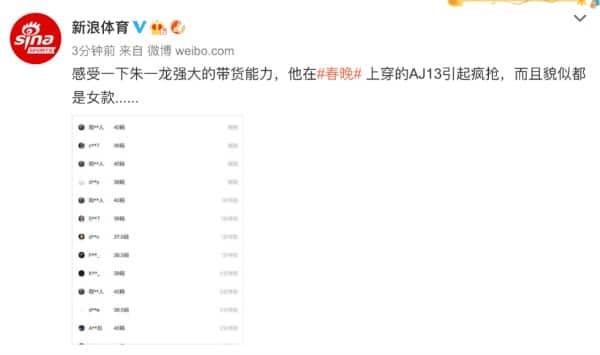 The topic has hit Weibo’s top trending lists, already hitting 130 million views earlier this afternoon. Read more about this during our live blog later today. The CCTV Gala was first aired in 1983, a year that is thus marked as the start of the Spring Festival TV Gala. 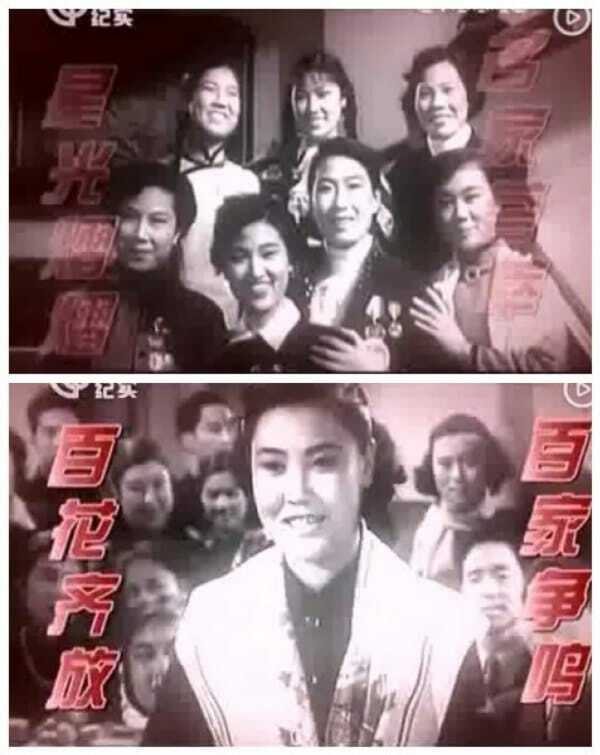 But before this time, as early as 1956, Beijing Television’s also had irregular New Year’s Eve broadcasts. 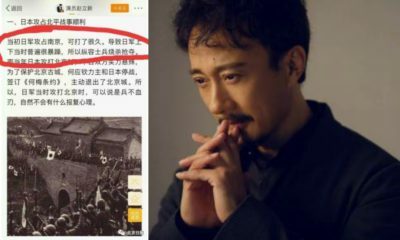 Trending on Chinese social media now is the hashtag “The Real First Chunwan” (#真正的第一届春晚#), with footage going viral of the 1956 edition (link) – receiving 250 million views at time of writing. Beijing opera master Mei Lanfang participated in this event, along with other renowned names, such as Chinese novelist/dramatist Lao She and famous scientists. “That [Gala] was better then than it is nowadays,” many commenters write. 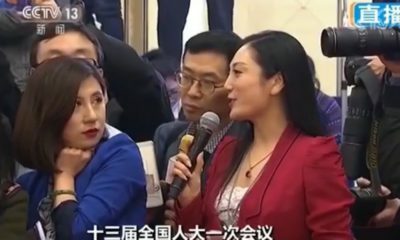 “We’re at a historical low,” others say, suggesting that the CCTV Gala as it is now is focusing too much on popular celebrities rather than on intellectuals, artists, and scientists. The complaining has already started, and the Gala is yet to begin! (19:55) It’s starting! What can we expect tonight? 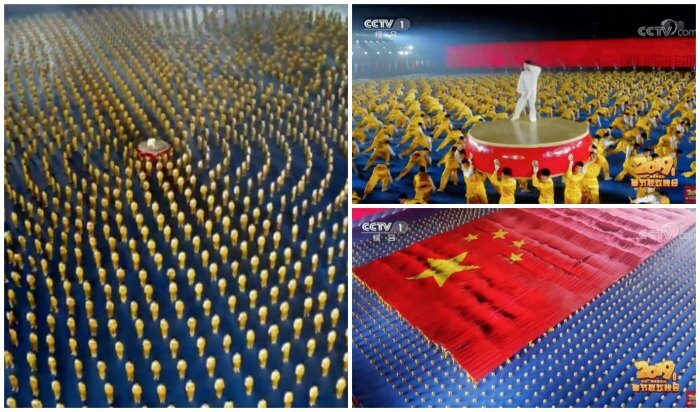 If you’ve previously seen the CCTV Gala, you probably know the sort of things you can expect tonight. The Spring Festival spectacle is always a mix of Chinese culture, commerce, and politics. 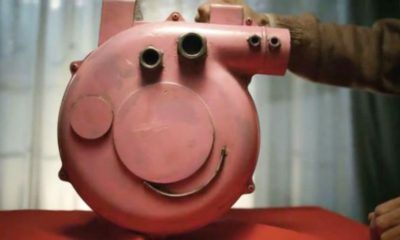 The show is notorious for carrying official propaganda and clearly emphasizing the themes that matter to the Party. However, no CCTV Gala is exactly the same, and there are always some noteworthy things about every annual show – in a rapidly changing China, the show always has certain changing features or styles that highlight a specific image of China and Chinese society, which can be telling for the official strategies on Chinese domestic and international affairs that lie beneath this constructed narrative & image. Tonight might see a similar trend as last year; the various acts and clips might not necessarily focus on the Communist Party and its leaders, but instead focus more on society, the people, ‘coming together,’ ethnic unity, and traditional Chinese culture. There will be plenty of singing, dancing, and comical skits as well as ‘crosstalk’ sketches, some magic, opera, and acrobatics. Some 40 performances will take place over the next four hours. There will also be a few short clips, ‘public service announcements,’ that usually focus on family values and socio-cultural unity. And we’re likely to see Jackie Chan again with a patriotic song. The opening act is titled “Sea of Spring’ (春海), led by, among others, Wang Qian, Song Yulong, Li Xiang, Yan Dingwen, Li Rongzhi, and Lin Qingjing. Various dance troupes are on stage, including that of the Shandong Art School and Shandong Normal University. 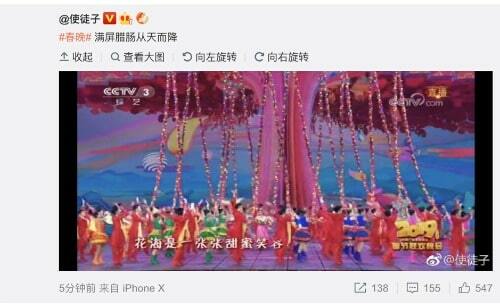 The ‘Chunwan’, the CCTV New Year’s Gala, is all the talk on Chinese social media. 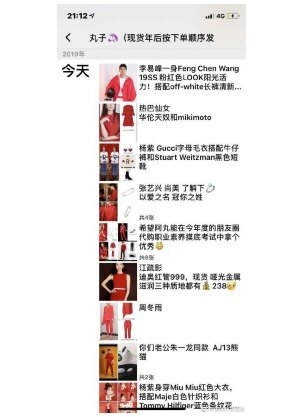 The hashtag “Chunwan” (春晚) has been dominating top trending lists on Weibo since Saturday, and has been a topic of discussion on Chinese social media for weeks. “Fake schedules” of the program were leaked, hyped, and recalled. 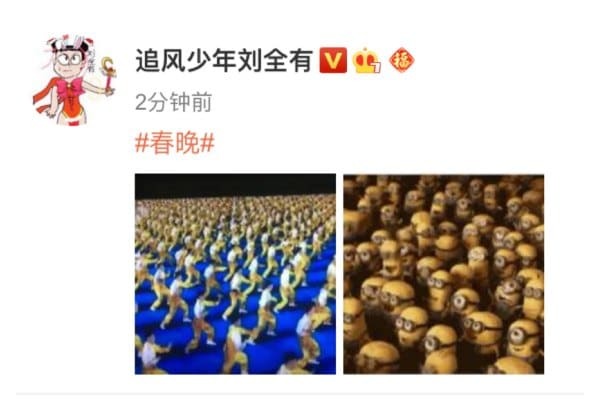 The real program was only shared by various Chinese state media one day before the start of the event, making the hashtag “CCTV Chunwan Programme” (#央视春晚节目单#) one of the biggest trending topics on Weibo right away. 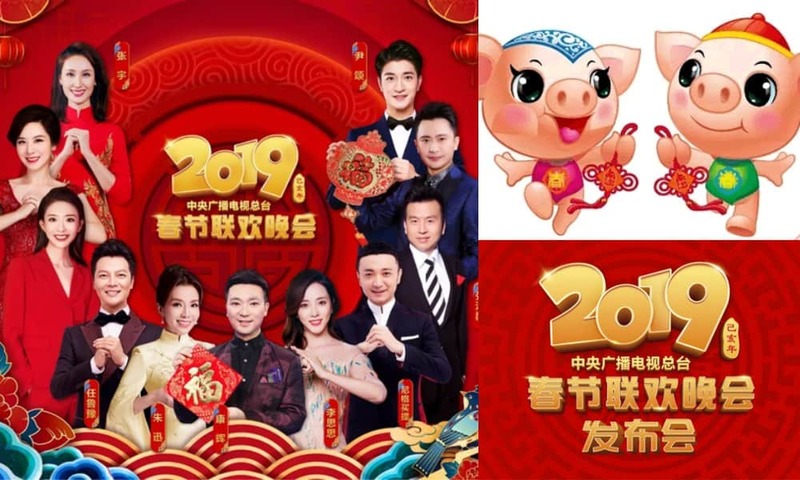 For this year, the hashtags “2019 CCTV Gala” (#2019央视春晚#) and “CCTV Year of the Pig Gala” (#央视猪年春晚#) are particularly used to discuss the variety show on Weibo. Just days ago, the hashtags were already viewed millions of times, going up to 600 million views before the Gala even started. Many netizens are anticipating to see top Weibo star ‘Angelababy,’ as well as famous actors Ge You and Cai Ming. The members of the super popular pop group TFBoys have also become a topic of discussion. One noteworthy aspect of tonight’s Gala is its new cooperation with Baidu. 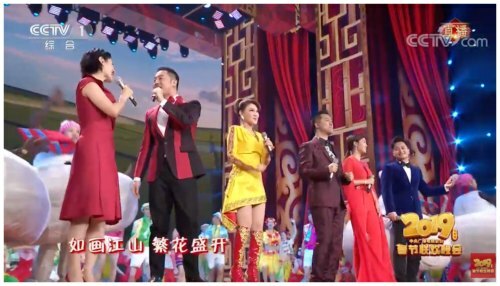 Since 2015, one important feature of the CCTV Gala that links it to social media platforms is the exchange of hongbao, red envelopes with money, which is a Chinese New Year’s tradition. 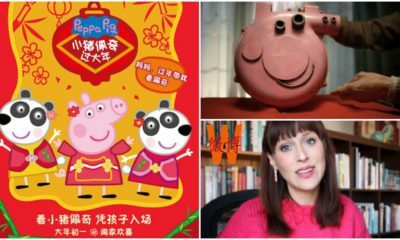 Over the past few years, viewers were able to receive ‘virtual hongbao’ by shaking their smartphones – this has drawn in a lot of young viewers who’d like to get a chance to win some money. 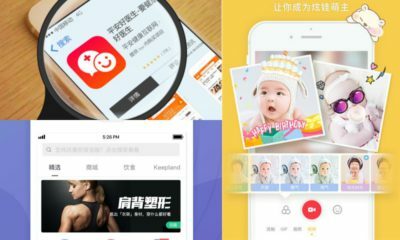 This year, instead of cooperating with Tencent’s WeChat or with Alibaba, some RMB 900 million (around $133 million) worth of hongbao is promised to be given to viewers by the Baidu Wallet app during the show. The show will have various moments where this Baidu activity will be promoted. (20:10) The Presenters introducing themselves..
As you just saw, the presenters briefly already said hello to the audience. We’ll see them throughout the night tonight. The top five presenters are all familiar faces. 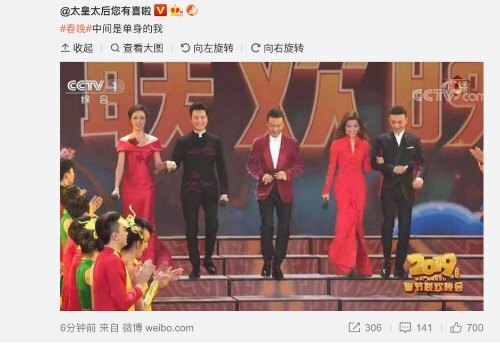 In fact, the exact same five hosts also presented the 2018 CCTV Gala. They are Kang Hui (康辉), Zhu Xun (朱迅), Ren Luyu (任鲁豫), Li Sisi (李思思), and Nëghmet Raxman(尼格买提). The two ladies: Zhu Xun (1973) is a well-known presenter and actress from Suzhou, who is presenting the Gala for the 6th time now. Li Sisi (1986) is a Chinese television host and media personality most known for her role as host of the Gala since 2012. 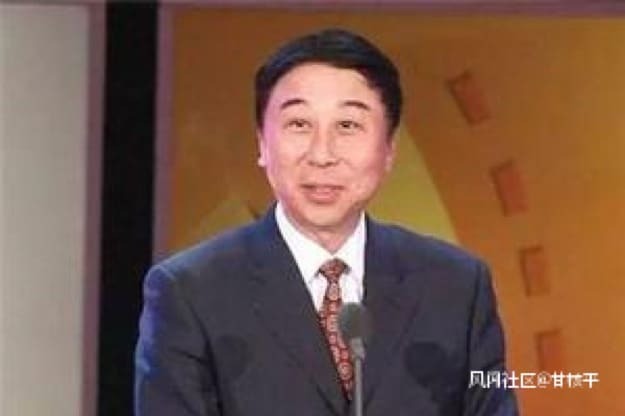 The three gentlemen: Kang Hui (1972) is a Hebei-born influential CCTV news anchor who has hosted the Gala since 2015. 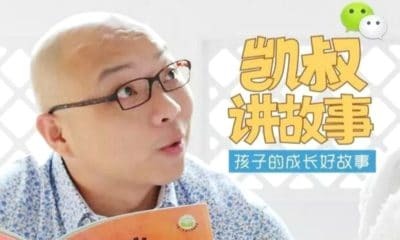 Ren Luyu (1978) is a Chinese television host from Henan, who has also presented the Gala multiple times (2010, 2016, 2018). Nëghmet (1983) is a Chinese television host, born and raised in Ürümqi, Xinjiang, who also is not a newcomer; this will be the fifth year in a row that he hosts the gala. The presenter who is not here on stage is Zhu Jun (朱军), one of the most well-known CCTV faces. He was involved in a ‘metoo’-like scandal in 2018 when he was accused of sexual harassment by a former intern, something which Zhu has denied. 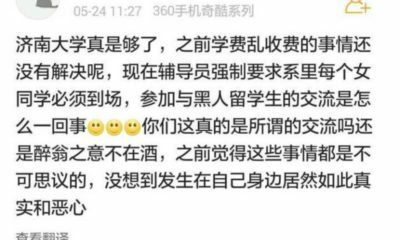 If the case goes to court, might become the first-ever civil sexual-harassment lawsuit in China, Quartz reported in January of this year. 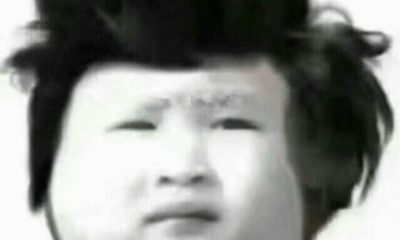 Although probably, it is unsure if Zhu Jun’s absence tonight has to do with this case. Another familiar face, CCTV hostess Dong Qing (董卿), is also not here tonight, although she hosted the CCTV Gala since 2005. Ok, so now we’ve really started. Next up is a dragon dance led by male dancer Liu Jia (刘迦). The Nanjing-born dancer is 28 years old and was trained as a dancer in the People’s Liberation Army Art and Drama College. The dragon dance is a form of traditional performance that is particular to the Chinese New Year. The dragon is believed to bring good luck. Did you know that the Beijing Aquarium even holds underwater dragon dances?! Some netizens think that the strips falling from the air look like “sausages falling from the air.” Oh, the creativity! Since 2016, the CCTV Gala has adopted a “multi-venue plan,” meaning that apart from the main Beijing CCTV no1 studio there are other ‘subvenues’ from where the show will be broadcasted. 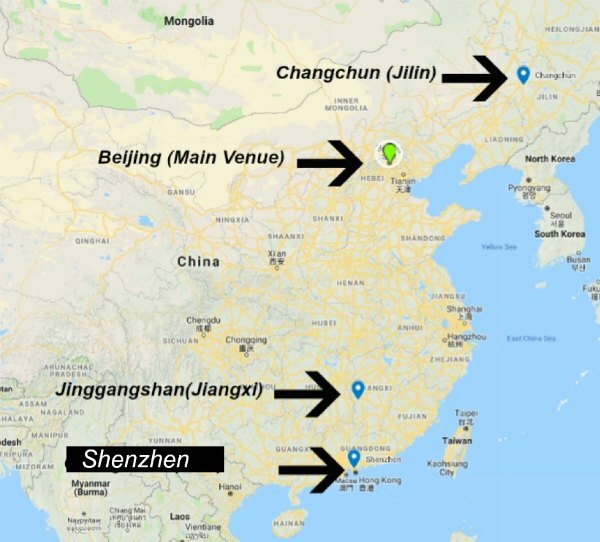 In 2018, these were locations in Guizhou, Guangdong, Shandong, and Hainan. The years prior, both in 2016 and 2017, there were also four other locations. This year, there are three sub-venues: Jinggangshan (Jiangxi), Changchun (Jilin), and Shenzhen (Guangdong). Each venue also has its own hosts, different from the Beijing main studio presenters. Each sub-venue has two hosts, equally divided between male and female presenters. (20:18) Here comes the first crosstalk, but one VIP is missing.. Together with well-known Beijing-born comedian Sun Yue (1979), we see Chinese actor Yue Yunpeng (1985), who is particularly known for his xiangsheng performances. Today, the topic received even more attention, with the hashtag “Feng Gong Not Appearing the Chunwan” (#冯巩无缘央视春晚#) ending up in the top trending lists with 160 million views on Weibo. 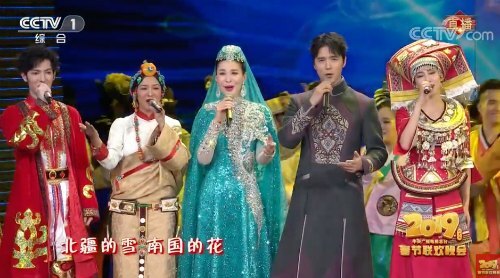 Earlier today, Chinese state media reported that Feng Gong was supposed to perform with a traditional ‘xiangsheng’ act that continued last year’s theme, titled ‘I love memorizing verses 2’ (我爱记诗词2), but that it did not pass the final screening of the show because it allegedly was “not funny enough” (“笑果不足”). As first jokes on the Gala are going viral, some people think five presenters might not be the right number. Kang Hui here seems to be the “single dog caught between two couples” – something that many people experience during Chinese New Year. Meanwhile, other viewers are more occupied with the color of the lipstick worn by the presenters. They’ve already been identified as Yves Saint Laurent and Armani brand lipstick colors, 405 and cpb311 respectively. 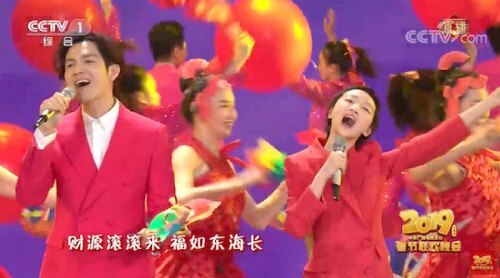 This performance, titled “China’s Happy Event” (中国喜事), was joined by Chinese singer Zhang Yixing (张艺兴), popular actress Zhou Dongyu (周冬雨), Hong Kong actor Wallace Chung, Dilraba Dilmurat (迪丽热巴), and Phoenix Legend (凤凰传奇), a Chinese popular music duo consisting of female vocalist Yangwei Linghua and male rapper Zeng Yi. 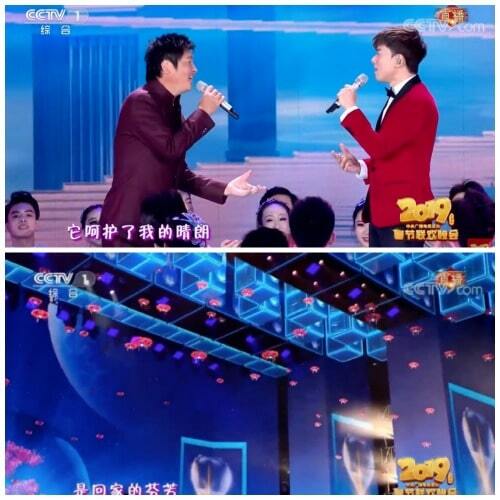 The duo was also part of the CCTV Gala in 2016 and in 2018. Chinese singer Lay Zhang aka Zhang Yixing (张艺兴) debuted as a member of the South Korean-Chinese boy group Exo and he is quite popular on Weibo. Is it the sound here, or did that sound very strange? The colors were very very bright though.. This is one of the acts that was quite talked about before tonight. It features Chinese actor and singer Li Yifeng, together with the popular actor Zhu Yilong. It was rumored before that the retired professional basketball player Yao Ming would also be a part of this act. (2.29 m (7 ft 6 in) tall). Don’t see him yet. It is quite obvious that this act is lip-synced, something that is discussed annually. It is often claimed that as long as it’s the singer’s own voices that are used to lip-sync to, it is allegedly “justified.” Because the show is live and so big, singing “live” might be too much of a risk, as some performances in the past have shown. Lip-syncing, however, is also not without dangers, as some singers can really be quite off. Various fan clubs of these artists don’t care about lip-syncing, though. Screenshots of fans going ab-so-lu-tely crazy over this performance are making their rounds on Wechat. First skit of the night! These sketches are called ‘xiǎopǐn’小品 in Mandarin, which basically is a Chinese comedic performance in the form of a short skit between two or more performers. It is similar to xiangsheng or crosstalk. Both are often performed together in Lunar New Year galas. 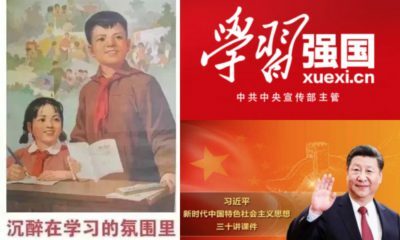 The main difference between the two forms is that xiaopin often involves the use of stage props and physical actions of the actors, similar to western comedic skits, while xiangsheng is closer to stand up comedy, relying primarily on speech and word jokes. This sketch is titled “platform” and is performed by various well-known actors, who are all playing people waiting for their train. An elder couple where the man has called the wife “honey” for a long time (before he actually forgot her name), and then there’s a young man whose wife left on a train with his jacket and mobile phone. 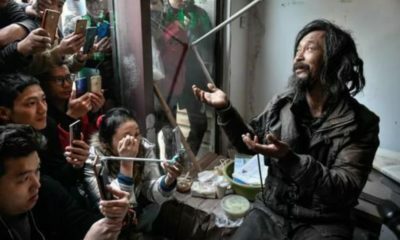 He is worried about leaving his wife with his mobile phone since he transferred 10,000 rmb to his parents before Chinese New Year, something she was not supposed to know about. When he manages to get in touch with her via the guard’s phone, it turns out she just transferred 20,000 rmb to both parents. 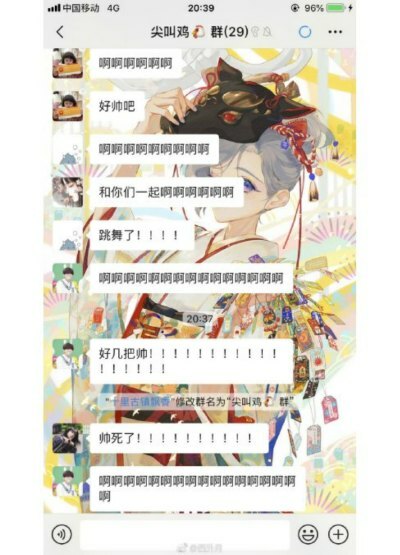 Meanwhile, another couple is fighting about whose home to visit for the Spring Festival. This sketch clearly touches upon the issue of love issues among various generations. Of course, it all ends with a happy ending, where all couples find a solution for their problems they’re all happy with. This year is clearly about “home,” “going home,” as stressed by the presenters. This song is titled “Mum, I’m home.” There’s a political message in the selection of singers. 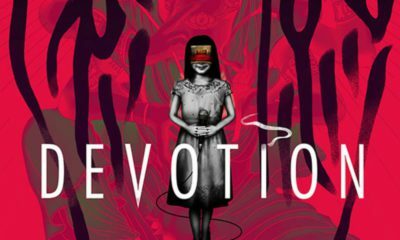 This song is sung by Taiwanese singer Terry Lin, the Hong Kong singer Joey Yung, and the overseas Chinese singers Sha Baoliang and Han Zi. We’re in Jinggangsheng (井冈山) now, the first sub venue of the night, which is also known as the “cradle of the communist revolution” or the “holy land of China’s revolution” in the southeastern province of Jiangxi. Two songs are performed here, along with a recital. One of the stars here is Chinese actress and singer Liu Tao, who is from Jiangxi herself. She sings together with actor Huang Xiaoming. Jike Junyi (吉克隽逸) sings the other song. She won third place in the first season of the reality talent show The Voice of China in 2014, which is when she became instantly famous. 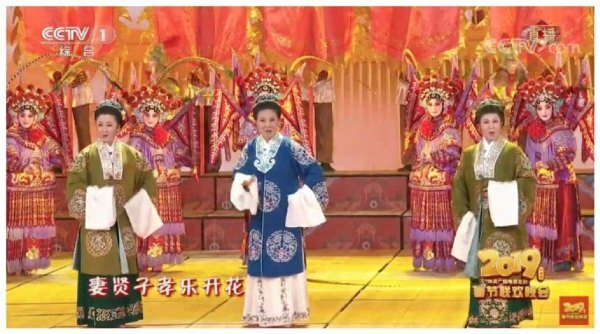 Time for some Traditional Opera by Yan Wei, Yuan Huiqin, and others, who perform “Beautiful Pear Garden” (锦绣梨园). This is the 9th act of tonight, of some 35+ acts in total. This is the only opera act, as far as I now know. 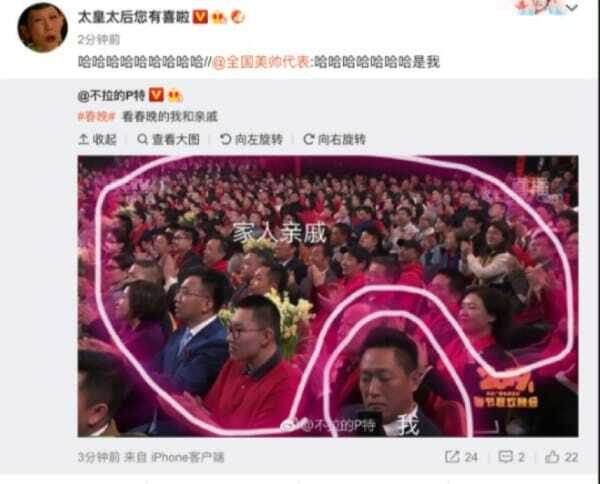 (21:17) Meanwhile, in the audience..
Every year, the CCTV Gala is themed around a certain topic. This topic, obviously, is in accordance with the official state ideology and is quite telling on what specific aspects the Party would like to propagate for the upcoming year. 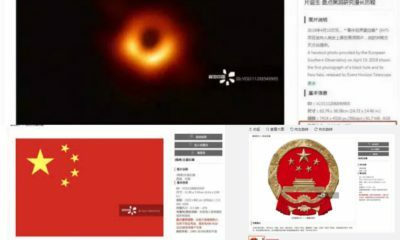 As said earlier in this liveblog; although the CCTV Gala is also a commercial event (the station is state-owned but also profit-seeking in a highly competitive media environment), it is also still highly political, and carries official propaganda along with consolidating political centralism. 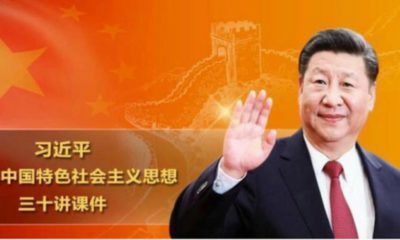 This year, the Gala is themed around the idea of “New China.” The full theme, as described by CCTV, is: “Advancing the New Era, Celebrating a Happy Year” (奋进新时代、欢度幸福年). The past two years, the Gala has been directed by Yang Dongsheng. This year, Liu Zhen (刘真), Deputy Director of CCTV arts channel, is in charge of the program. He is known for previously directing the 2009 anniversary night of the Great Sichuan earthquake. This office skit is performed by Chinese actresses Yan Ni and Ya Hailong, together with actor Zhou Yiwei. The skit evolves around a rehearsed marriage proposal going wrong, with one worker accidentally proposing to the company director. 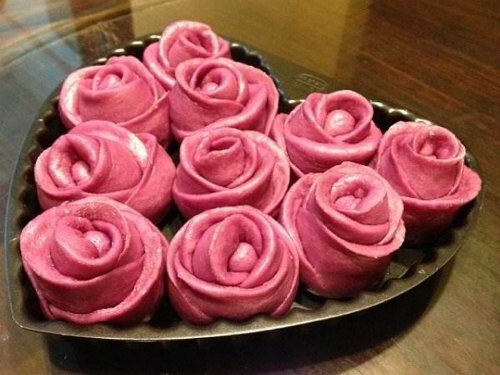 The boss walked in when they were practicing, and misunderstood the gifts and cakes they prepared, thinking they were for her instead. Later on in the act, the secret is revealed, but the boss responds surprisingly ok when the office worker revealed he was always working overtime, having no time for these personal matters. Work pressure is a recurring theme on social media too, a theme incorporated in this sketch. Two ‘kings’ of Mandopop, Sun Nan and Zhang Jie (also known as Jason Zhang) perform on stage here. Sun Nan has performed at the CCTV Gala several times before. His 2016 performance with 540 robots, all dancing simultaneously, was quite spectacular. 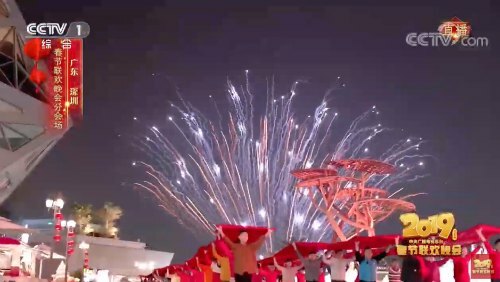 They are accompanied by the Zhongnan Minzu University Music Dance Troupe, and you can see drones flying all around them. The first martial arts performance of the night, really quite spectacular, performed by members of the Shaolin Tagou Martial Arts School from Henan. This is also the first big Chinese flag we spotted tonight, and it’s HUGE!!! The third sketch of the night features an all-star cast with actors Ge You, Cai Ming, and Pan Changjiang. Cai Ming (1961) is known for performing sketch comedy in CCTV New Year’s Gala since 1991. She is known for her sharp language. Cai is quite active on Weibo. Earlier this week, she posted a ‘selfie’ of her and Dilraba Dilmurat, the singer of Uyghur heritage who appeared in the show earlier tonight. Pan Changjiang (潘长江, 1957) is a famous skit actor who has regularly appeared in the Gala since his younger years. His colleague Ge You (also 1957) is one of the most recognizable acting personalities in China. He plays a man who is selling “health products,” conning older people out of their money. 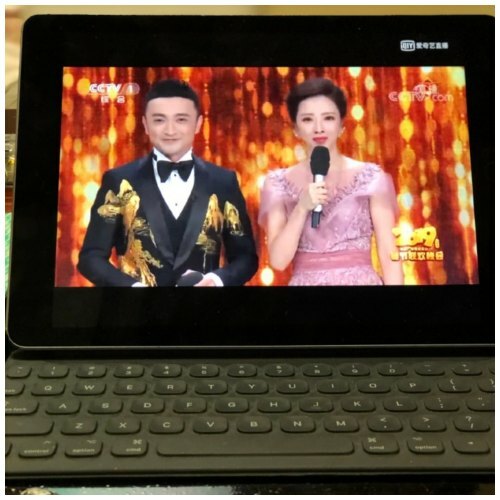 It really seems that the Gala has turned into a social media craze, where people are more interested in the jokes going around Wechat and Weibo than the actual event itself. 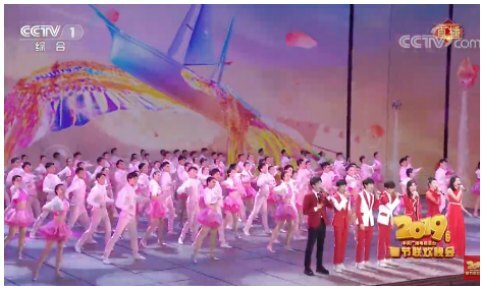 This also means that the Gala is becoming more popular among young people, who are creating their own traditions from the classic ‘Spring Festival ritual’ of gathering around the TV with the family to watch the Gala together. It was the most spectacular act of the night thus far. But were those real people or were they Minions? This is the joke that’s going viral now. This is the fourth time that members of TFBoys are making their appearance at the show since their first performance at the 2016 CCTV Gala. Taiwanese magician Lu ‘Louis’ Liu (刘谦, 1976) is at the center of this magic act. He is known as the only Taiwanese magician to perform in Hollywood’s ‘Magic Castle,’ and is commonly referred to as ‘Taiwan’s most renowned magician.’ He previously performed at the CCTV Gala in 2009. 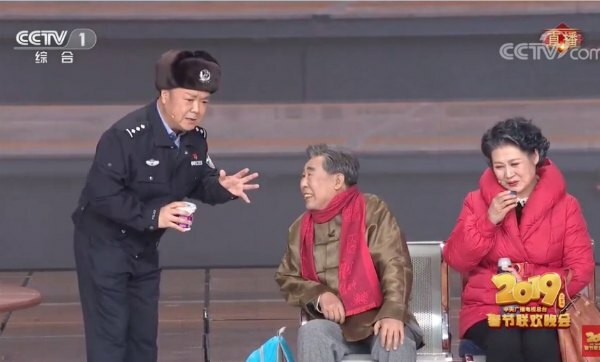 This sketch is called “Seizing a seat,” and I’d actually expected it to be hinting at two separate incidents on Chinese high-speed trains in 2018 that became huge trending topics. In late August of 2018, one rude man from Shandong who refused to give up the seat he took from another passenger became known as the “High-Speed Train Tyrant” (高铁霸座男 gāotiě bà zuò nán) on Chinese social media. 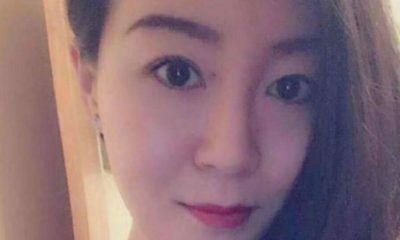 Later, a woman from Hunan was dubbed ‘High-Speed Train Tyrant Woman’ (高铁霸座女 gāotiě bà zuò nǚ”) by Weibo netizens, when a video of her bizarre behavior also became trending; she had taken a seat assigned to another passenger while riding the train from Yongzhou to Shenzhen and refused to give it up. 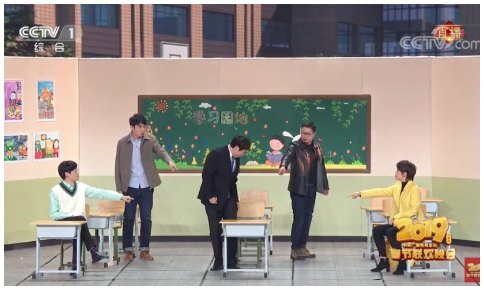 But this particular sketch now seems to be focused on “seizing a seat” in a classroom instead, with parents during a parent’s meeting fighting over who gets the best seat at the school. The story focuses on parents who are not involved in their kid’s education, leaving the responsibility to the school, with the moral behind the story allegedly being that parents should be more involved in their child’s education. 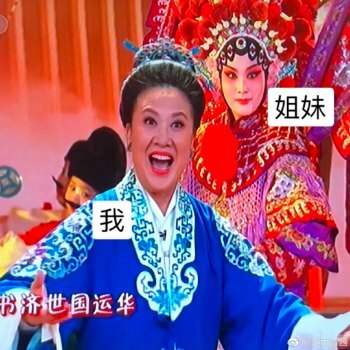 “This is my life,” some online commenters are saying, posting the meme below (the speed in which Gala-related memes are spreading on Weibo and Wechat is incredible!). Throughout the Gala, there are smart people who are tracing down the clothes and shoes worn by the performers, which are also for sale. (22:41) All over the place! After a brief public announcement, we’re now watching the dance “Looking for Friends.” This dance is performed by the ‘Air Force Blue Sky’ children’s dance troupe (空军蓝天幼儿艺术团) and it is all over the place! The song “No Sleep Tonight” (费玉清) is brought by Fei Yu-ching. 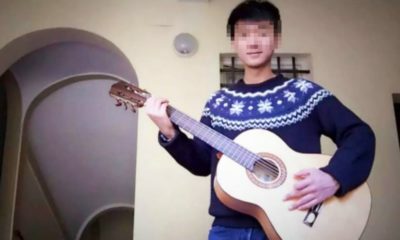 This Taiwanese singer recently became a topic on Chinese social media with a video featuring his cool dance moves during his younger years. After 46 years in showbiz, his Farewell Tour is taking place this year. Now it is time for the aforementioned Baidu activity. 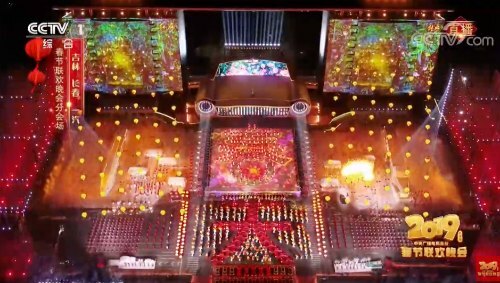 At this year’s event, China’s search giant Baidu, has the exclusive right to interact with the huge audience of the CCTV Gala via red packets interactive activity. The audience can get red packets through shaking, searching and watching video clips on Baidu app. On stage, we see the award-winning (stage) actor Lin Yongjian, together with Sun Tao and Ju Hao, a well-known comedian. Usually, the sketches performed during the Gala can be quite controversial. Sometimes for the way they depict women, last year specifically for the Africa blackface skit. It seems that this year, the sketches are quite safe and aren’t triggering any controversy, yet. But the night is still young! Many of the clothes and shoes and other items featured in today’s Gala are becoming hot selling items. Right now, people are going crazy over the Air Jordans that were worn in one of the acts earlier tonight. Moving over to the second sub-venue of the night now, where we see Aska Yang (Yang Zongwei) singing on stage. Aska Yang had his debut in Taiwan as a contestant on season one of Taiwanese TV singing contest One Million Star. He is joined by Angela Yeung Wing, better known by her stage name Angelababy, a Chinese model, actress, and singer based in Hong Kong, who is one of the Weibo stars with the most followers. Fireworks! Drones! And one of the cars turning into a ‘Transformer’! So far, the sub-venues offer some of the most spectacular performances of the night. The focus on cars here relates to Changchun as one of China’s ‘car cities’ as it is home to the brand that produced the first national auto brand (长春一汽), last year was the 65th anniversary of the factory’s founding. This is yet another dance, there are supposed to be four big dancing acts tonight. The dance is titled the “Dunhuang Flying Asparas” (敦煌飞天), and is performed by the National Ballet of China, also known as the Central Ballet Troupe, which employs over 70 dancers. 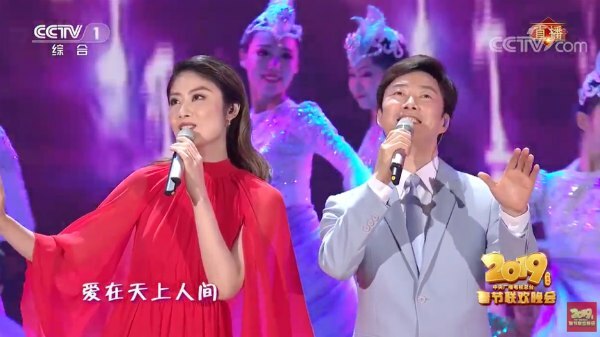 This song, titled “My Motherland And I” (我和我的祖国), is one of the acts that has received quite some attention in Chinese media prior to the Gala because of the very special reunion between some of China’s older legendary musical artists. This special reunion also shows that this year, the Gala wants to pay extra attention to China’s elderly, something that contrasts with last year’s Gala, that was very much focused on young people and new talent. One of the performers here on stage is Guo Shuzhen, who is 92 years old and is a famous “legend” within China’s music education. All artists here are very famous ‘legends’; Li Guangxi (1929), Hu Songhua (1931), Liu Bingyi (1935), Yu Shuzhen (1936), De Dema (1947). Also on stage is Yang Hongji (杨洪基, 1941), a Chinese national-level actor and one of China’s most outstanding baritones. And there’s Guan Mucun (关牧村,1953), a female Chinese mezzo-soprano singer from Henan province who is known for developing her own musical style by blending Western and traditional Chinese melodies. They all perform together with Chinese artists of the younger generations. Chinese xiangsheng performer, actress and comedian Jia Ling (1982) stars in this comical skit together with Zhang Xiaofei and Xu Juncong. The story features a young man who ordered a cleaning lady to clean his apartment, but the woman (in red) has an injured shoulder so she can’t really do it. She ordered another service to do the cleaning for her (in yellow) instead. That young woman then thinks the lady in red is actually the wife in the house who refuses to clean the house – all the confusion between the people is creating a chaotic and comical situation. (23:39) Here comes Jackie Chan! This year, the title of the song is a bit deeper than in previous years: it is titled ‘My Struggle, My Happiness’ (我奋斗我幸福), and is sung together with Hong Kong singer and actor William Chan and with Deng Lun. Also on stage are performers from Bapaweilai, a children’s art education group based in Hong Kong. 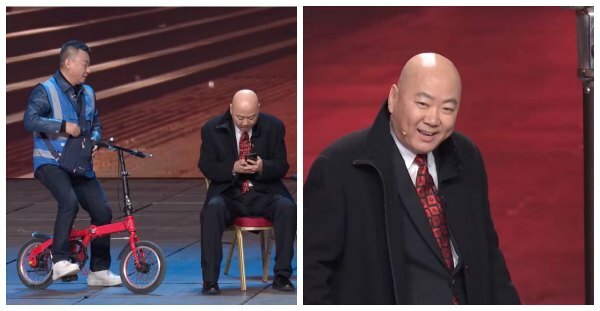 While “Together towards Happy China” is being performed on stage by Zhang Ye and Lu Jihong, famous Chinese actor Ge You is all the talk on Weibo for a photo that has popped up of him backstage, showing the actor tired on the couch. 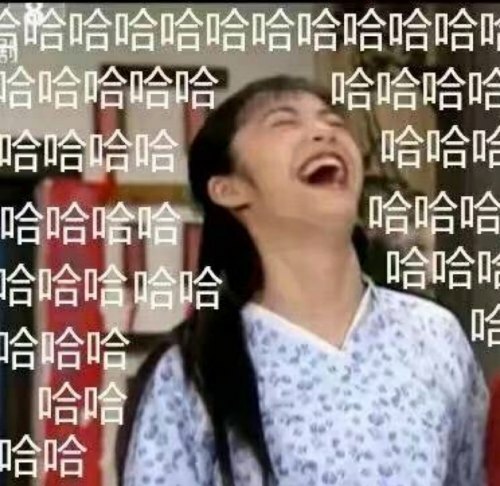 A famous meme in China also shows the actor in a similar position. As every year, this is the part of the show where some ‘exemplary persons’ get honored for their accomplishments. 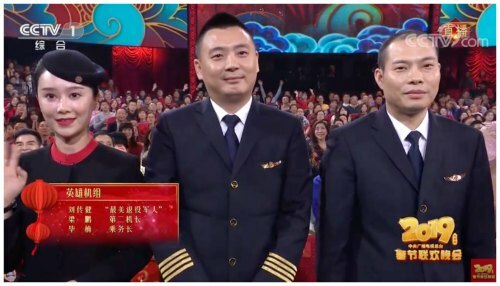 Noteworthy is that the crew of Sichuan Airlines is honored tonight. In May of 2018, pilot Liu Chuanjian on Sichuan Airlines 3U8633 made an emergency landing in southwest China after a broken cockpit window sucked his co-pilot halfway out of the aircraft. 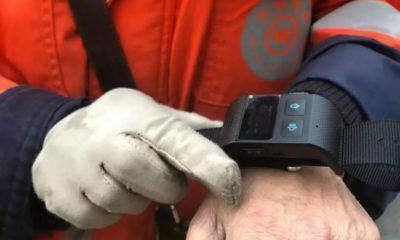 He braved the intense cold and blasting wind to land the plane in about 20 minutes, and in doing so, rescuing all 128 people aboard the Airbus A319. This song really resonates with the Gala’s “New China” theme. The singer is Wulan Tuya (乌兰图雅), who is also known as the “Flower of Mongolia.” She was born and raised in Inner Mongolia, and now combines elements of Mongolian traditional music with electronic beats in her music. 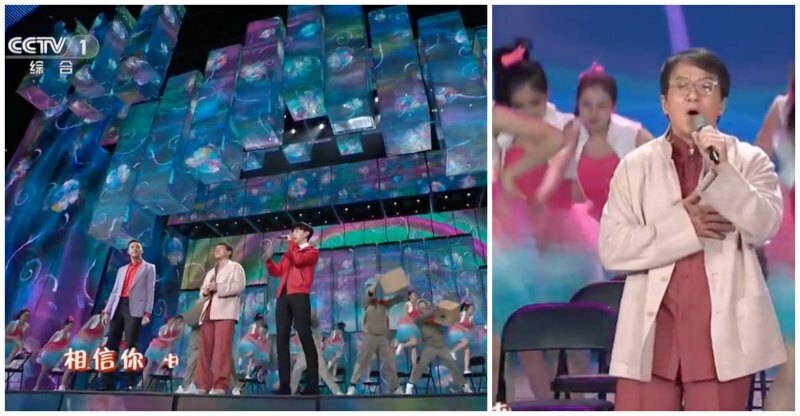 This is one of the spectacular performances of the night, that is joined by a number of artists who were selected through a special CCTV Gala contest. The other performers come from various performance groups from Beijing, Shandong. 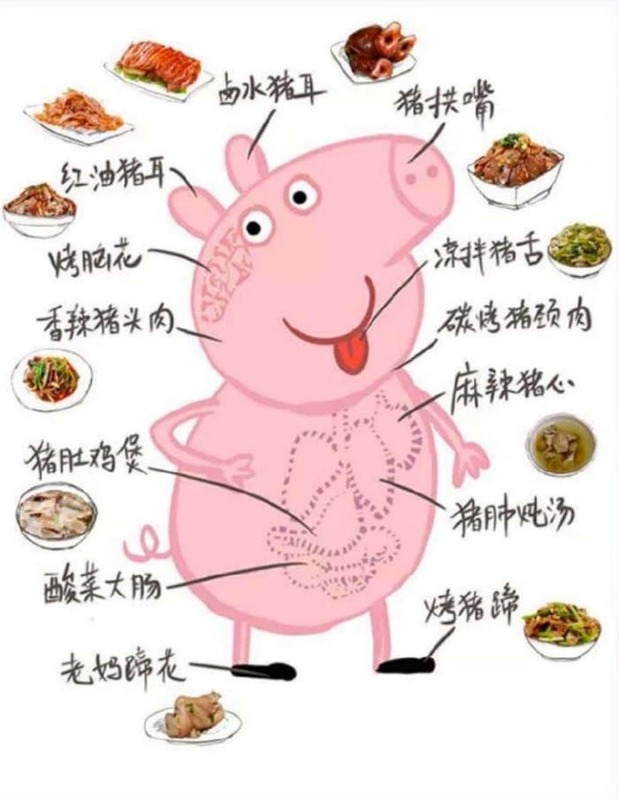 Harbin, Sichuan, etc. “Together With my Homeland,” sung by Lei Jia and Han Lei, is the last song before the 0.00 countdown moment. Lei Jia is a Chinese folk soprano and ‘national class one performer.’ Han Lei is a singer-songwriter of Mongol descent who is also known as Senbor. He rose to prominence in 1997 on the CCTV New Year’s Gala. The screen behind the artists shows some old-school flag raising and China’s urban skylines. (0:00) Time for the Countdown!!! Fireworks everywhere, firecrackers everywhere. Time to sing about building on the Chinese Dream together, a theme that has been consistently featured in the Gala over the past years. Singers: Cao Fujia, Xian Zi, A Yunga, Ju Laiti, and ‘Xingguang Dadao’ talent show winner Ang Sa. We’re reaching the final acts of the night. 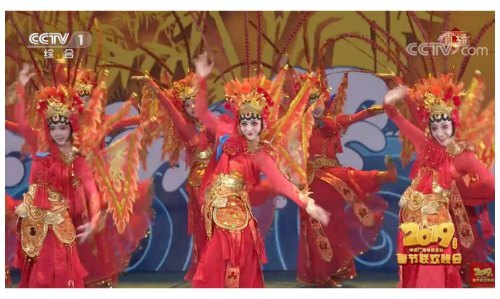 This performance shows acrobatics by various renowned acrobatic groups from Henan, Guangxi, Dalian, and other places. 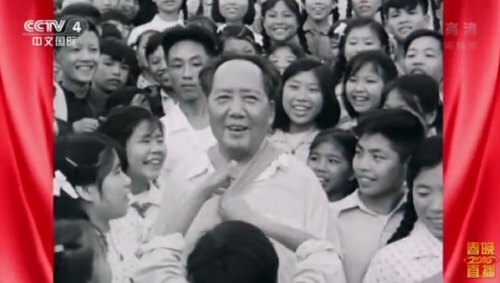 Thus far noticeable tonight: the skits have been very ‘safe’ and there has been no *excessive* display of straightforward political (Party) themes compared to other shows in earlier years; the images of Mao, Deng, Xi, and others that would usually make their way into the show have not been there (or I haven’t noticed them). Although there’s usually a very clear focus on unity in bringing together various ethnic groups, that has not popped up in this show as much as it has in the past. Instead, there has been more focus on ‘old’ and ‘young’ uniting, with “China’s New Era” being the clear theme of the night. 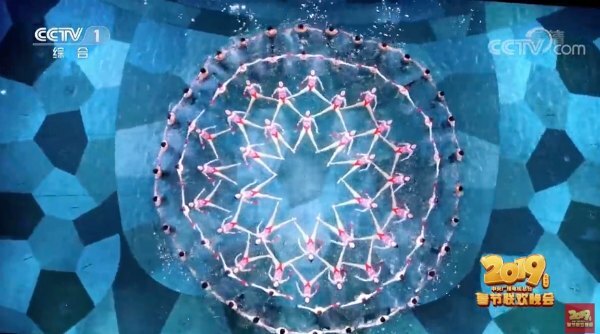 The acrobatic performance is followed by a special segment that shows water ballet. 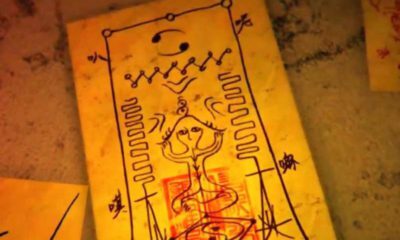 The act is titled “Burst into Bloom” (绽放). ‘Daijia’ is a service that is provided by various companies in China, where one can hire a substitute driver to drive them home in their own vehicles. This is what this last skit of the night focuses on. The service is encouraged because it decreases the risk of people drunk driving. The driver will usually arrive by bike, then drives the person home in their own car, with the bike in the back, and then cycles on to the next customer from there -quite convenient and safe (for the people who’ve been drinking and can no longer drive)! In this sketch, with Guo Donglin and Shao Fenghe, the drunk man actually has no money and just called the driver because he is lonely, lovesick, and needs some companionship. The moral of the story? No matter how low you are, you can always get back up. After the song “The Brightest Star in the Sky,” we’ve now arrived at the final of the night, featuring the dance performance “Outstanding Beauty” with lead dancers Li Yanran, Wang Jiaxin, and Hu Tulan. 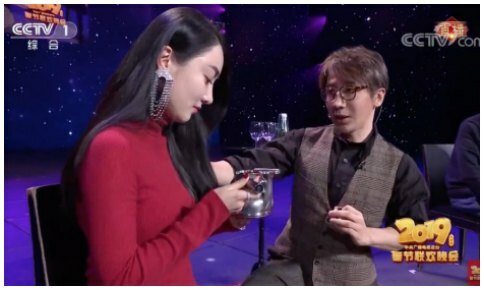 A noteworthy moment before this segment is that the presenters of the night asked the viewers when they’d get married and have a (second) baby…(啥时候结婚啊？啥时候要二胎啊). Perhaps it’s mocking the pressure many young people at home are facing. The last song of this night is “Unforgettable Night” (难忘今宵). 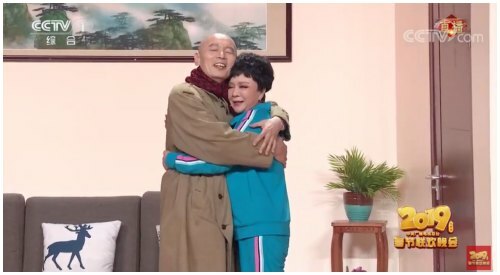 It is sung by the 74-year-old singer and dancer Li Guyi (李谷一), who became famous with the song ‘Homeland Love’ (乡恋) around the time of China’s Reform and Opening Up – the singer and her songs are nostalgic for many viewers. Li Guyi also appeared at the very first version of the Gala in 1983, and became the singer that sang the most at the event. Li Guyi sings the same song every year at the end of this show. The last song ends with all performers of the Beijing venue on stage. The song repeats the phrases 共祝愿 祖国好: let’s all wish together that the country will be good, that is will last long and be prosperous. The hosts wish everyone a happy new year. It’s a wrap! 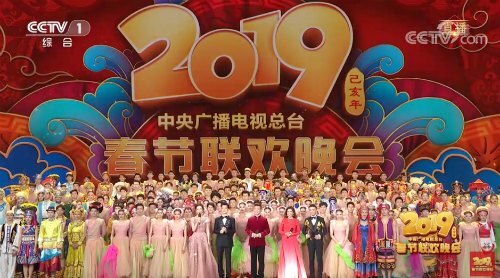 Thank you all for watching the CCTV Gala with us and happy new year to you. Gao, Yuan. 2012. “Constructing National Idenitiy through Media Ritual: A Case Study of the CCTv spring Festival Gala.” Master’s Thesis, Media and Communication Studies, Uppsala University. Jing, Meng. 2019. 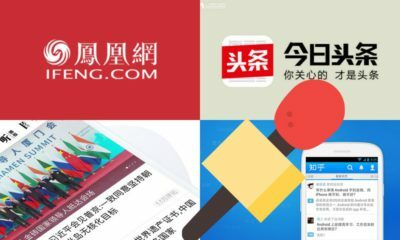 “Baidu seeks to play catch up in mobile app race with bet on world’s most-watched TV show.” South China Morning Post, 18 January https://www.scmp.com/tech/big-tech/article/2182616/baidu-seeks-play-catch-mobile-app-race-bet-worlds-most-watched-tv-show [2.2.19]. If you enjoy What’s on Weibo and support the way we report the latest trends in China, we would appreciate your donation. It does not need to be much; we can use every penny to help pay for the upkeep, maintenance, and betterment of this site. See this page for more information. 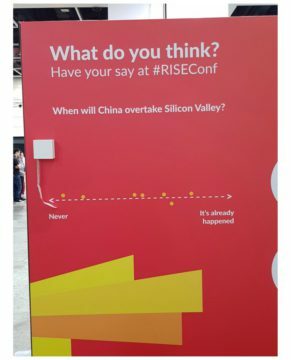 RISE conference: Is China surpassing the US as the world’s digital leader? 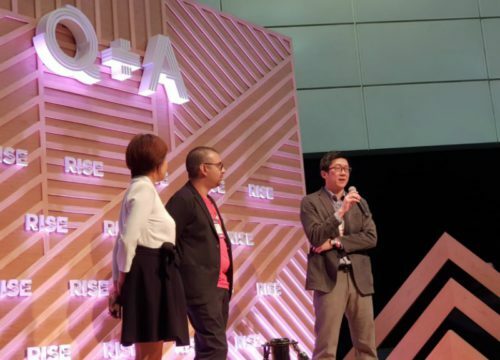 At RISE, Asia’s biggest tech conference, the rise of China as tech leader is a major theme. What’s on Weibo reports on the launch of the China Internet Report and other China-related talks at RISE today. 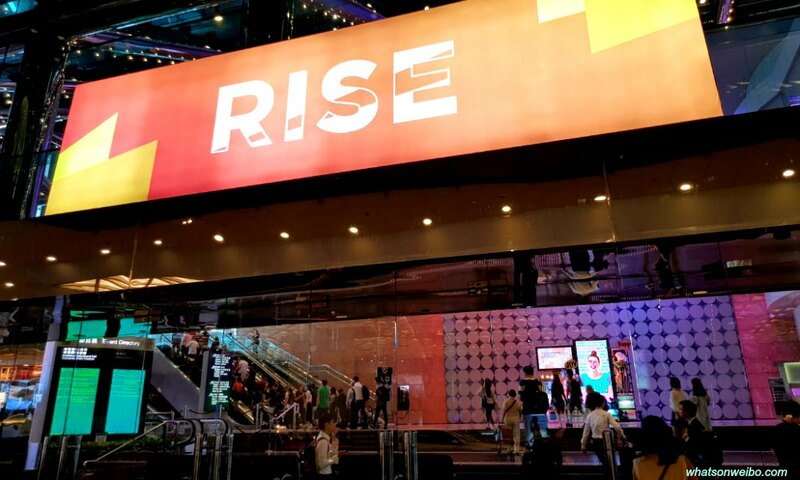 China is a major theme this week at RISE, the largest tech conference in Asia, taking place at the Hong Kong Convention and Exhibition Center from July 9-12. Besides wide attention for Chinese latest startups and tech developments, a central question posed at this year’s conference is if China is the current world leader in technology, and if it has thus surpassed Silicon Valley as the global tech powerhouse. In the morning of July 12, Edith Yeung (500 Startups), Ravi Hiranand (Abacus), and Chua Kong Ho (South China Morning Post) reveal the hugely publicised China Internet Report, which brings a definitive outlook of the companies, industries and trends that are changing the technology space. Also on Tuesday, another panel with various speakers from Bloomberg to Withinlink address the question of whether or not China is now the world leader in technology, and if its rise should be feared by the US. What’s on Weibo is here at RISE to live report for you – refresh page for updates (update: live blog now closed). 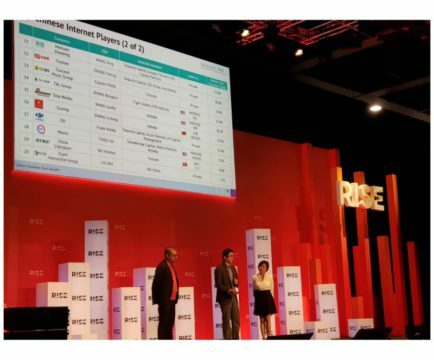 In their presentation of the latest findings when it comes to China and the internet, Edith Yeung, Ravi Hiranand, and Chua Kong Ho present four major themes that are crucial to digital China. Firstly, as explained by Chua Kong Ho, “Chinese Internet giants are doing everything.” The major players such as Baidu, Alibaba, and Tencent are not just involved in e-commerce or social media, but also, for example, in the e-sharing economy, gaming, education, media, or artificial intelligence – penetrating all markets that matter in China today. Second, Chinese internet empowers rural populations. E-commerce platforms such as Taobao, for instance, give ample new opportunities to people in the Chinese countryside to set up new businesses; a crucial theme in China’s digital developments today, as it greatly impacts society. The Chinese Internet Report launched today, click to see. (URL https://www.abacusnews.com/china-internet-report/). 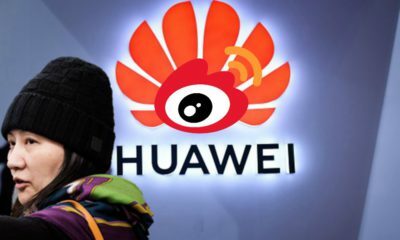 Third, Chinese internet companies embrace ‘social’: social media plays a major role in China’s digital market, arguably much more than it does in countries such as the US. And last, Ko explains, the Chinese government is the visible hand – controlling all corners of the Chinese internet. As Edith Yeung dives deeper in what matters in China today when it comes to digital developments, she focuses on the importance of AI and how tools such as facial recognition are playing an increasingly important role in Chinese society today; not just for practical matters such as train ticket collections, but also for governance, helping catching fugitives or jaywalkers. In terms of AI, China is investing the most in the world right now. 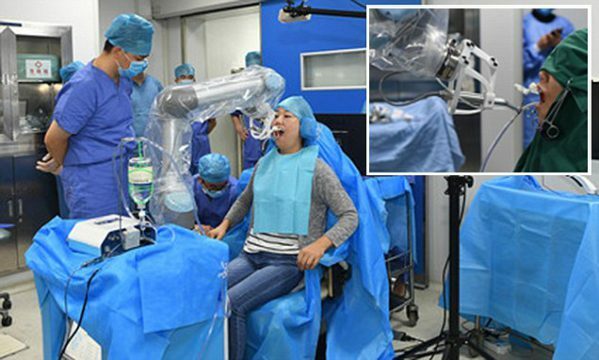 China’s first robot dentist fits implants into a patient’s mouth in 2017 (photo via Dailymail). Robotics is also an area of major development in China, as intelligent service robots continue to upgrade across industries, including e-commerce and healthcare. As an example, Yeung mentions that in September 2017, the first robot dentist was introduced in the PRC. But blockchain technology is applauded more from the authority side. Although still in its infancy, companies such as Alibaba are already working with the government in applying blockchain technology across various industries. 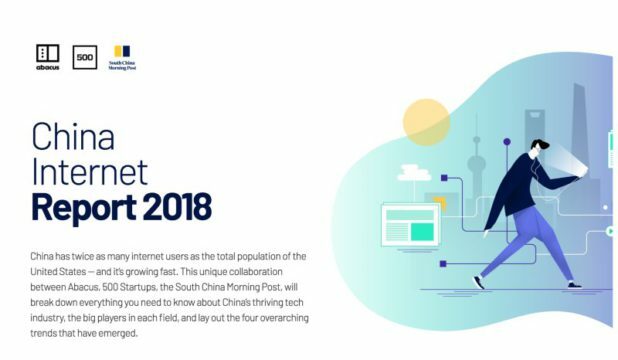 Launch: The full Chinese Internet Report 2018 can be found here. For Edith Yeung, who was selected by Inc’s Magazine as “one of the Silicon Valley investors you must know,” the question of whether or not China is the global tech leader is not a difficult one. “I really think China is leading in so many areas, and people elsewhere in the world just have no clue,” Yeung says during the Q&A following the presentation of the China Internet Report. Yeung also links the growth of Chinese tech companies to the working attitude of the people that is related to China’s history. Silicon Valley has always been seen as the world leading technology hub. 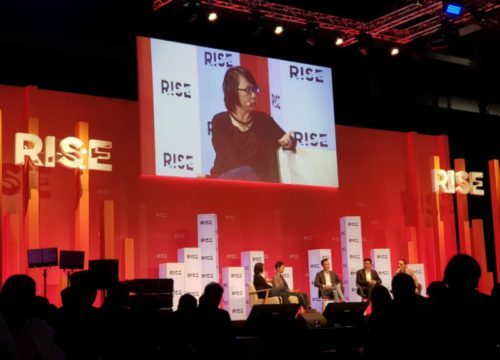 During another RISE panel, simply titled “Is China now the world leader in technology?”, speakers Bessie Lee (Withinlink founder), Wayne Xu (Zhongan International president), Harry Hui (ClearVue Partners founding partner), Lei Chen (Xunlei CEO), and Tim Culpan (Bloomberg columnist) will address if the US should fear the rise of China as a tech superpower. Lee stresses that in mainland China, the regulations always fall behind the technology development. “It’s not there yet,” she states. Other speakers agree with Lee. Wayne Xu sees China as a leader in financial and consumer-facing areas, whereas it is still lacking in others. “But as for AI, China is leading,” – a statement all speakers today stress. Chinese companies and the government have more focus on technological development today than the US has, Xunlei’s Lei Chen states. But still, he says, China has a lot of catching up to do. Both Harry Hui and Wayne Xu both say that China will follow its own path in its rise as tech leader; a unique road that is different from paths taken by other leaders such as the US. 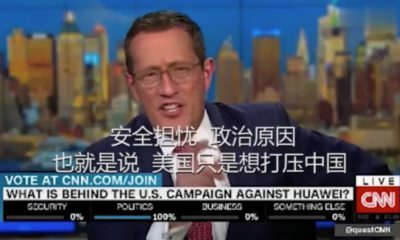 According to Bessie Lee, one dimension of this road is that “Chinese are going to take on the US market, but the US are not going to take on the Chinese market” – a crucial dynamic that will eventually determine who the global tech leader will be. As for today’s speakers, they all seem to agree that if China is not already the leader in tech, it will be in the future. 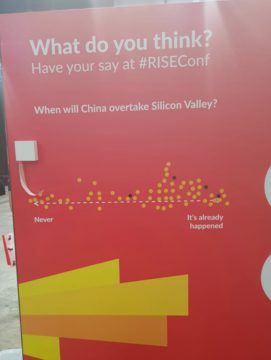 Hours after the kick-off of RISE, conference visitors also hold similar views (see image above); according to the majority of voters, “when China will overtake Silicon Valley” is not a question for the future – it is already happening. Also read: The top ten things you need to know from the China Internet Report by Abacus. This live blog is closed. 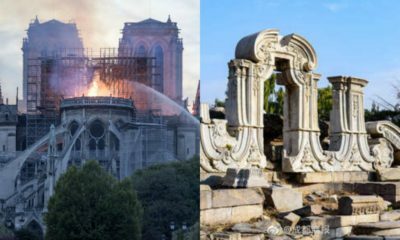 Keep checking in on What’s on Weibo in days to come for more updates on RISE and latest news on what’s trending on Chinese social media.